So, Where Is Lake Tahoe? And What is Tahoe All About? If you're anything like me, someone mentions Lake Tahoe and you say, what? So, Where is Lake Tahoe? Funny you should ask, because Lake Tahoe is one of the lucky destinations that gets to be in two places at once! California and Nevada meet in Lake Tahoe - how romantic, right? The Lake itself is makes up a little over 191 square miles, enough for you to get in a lot of water sporting time in the summer months! Lake Tahoe is an extremely popular destination year round though, mostly for the outdoor adventurers. When the weather is warm, it's the perfect place to go on vacation to get away from the city life. Enjoy all the break hiking and biking trails that make up the area surrounding the lake. There are both mountainous and flat lands to roam, depending on your preference and abilities. If hiking makes you feel like a fish out of water, no worries, you did come for Lake Tahoe after all, right? Enjoy all the water sports you can handle (and don't worry, there are numerous places to rent all the equipment you'll need so you don't have to lug your own across country) or enjoy a quiet time on the lake fishing. When the weather turns colder, people hop on the slopes all winter long. The mountains in Lake Tahoe are waiting for you, and there are tons of awesome Tahoe ski resorts that cater to the people who are in it more for a relaxing vacation and for those who want to spend the whole time shreddin' the gnar! Yes, Lake Tahoe is the ultimate outdoorsmans destination, but you really don't have to love sweating on the biking trails or getting water up your nose to enjoy a stay here. Although, if you do love that stuff, dive right in! 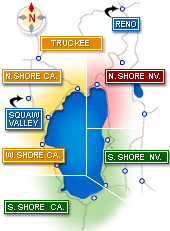 What is Tahoe Known For? Lake Tahoe is the largest freshwater Lake in the Sierra Nevada! But the actual lake kind of takes a backseat to everything that you can do here (even though the beautiful scenery in this setting is what draws people to the area. Lake Tahoe is one of the most popular destinations for weddings you can find! People plan the most elaborate and elegant weddings in Lake Tahoe and also just get hitched on the spot after a romantic getaway weekend, when it just feels right. Really, trust me, that happens - we hear about it all the time! If you think that Lake Tahoe is right for your wedding, you're probably right! There are so many wedding chapels in Lake Tahoe to choose from, and many of them will give you the elegant backdrop of the lake as you tie the knot. A lot of people enjoy the outdoor weddings in Lake Tahoe, because who would want to miss out on these photo ops? There are tons of great wedding photographers in the area to capture your special day in the perfect light. Everyone has a great time at Tahoe weddings and it's something that all of your guests will remember forever. We know that a Lake Tahoe wedding is a destination wedding, and all of the wedding coordinators in Tahoe know that too! They've made it their job to help out-of-towners plan their wedding from afar, and we rarely hear a complaint at what excellent service people receive! Lake Tahoe is also a beautiful honeymoon destination, and there are so many beautiful Tahoe rentals (everything from cozy cabins to top of the line luxury accommodations) and resorts in Lake Tahoe to spend your first few nights with your new ball and chain. Tahoe is also one of California's top destinations for skiing. Obviously, most people travel during the winter to warm places like Mexico, Florida and well... California, but if you're looking for a popular place to go skiing on your winter vacation, this is your spot! People really love to ski Tahoe, but you don't have to know what you're doing before you come! It's the perfect place for everyone from the beginner to the expert level! Tons of places in Lake Tahoe offer ski lessons for people of all ages, making it a destination for family vacations, romantic weekend getaways or a trip away with all your buddies. You don't have to be active the entire time you're in the area. People come here all the time to soak in the scenery and get away from the city - you work all week, we get it if you don't have the energy to work on vacation. Tahoe is packed with things to do as well as ways to relax, so no matter what your vacation goals are, it's probably somewhere that you can accomplish them! 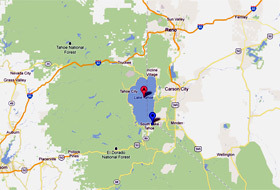 Tahoe's Best can help you plan any trip to Lake Tahoe, from helping you find a place to stay, and helping you find a great deal on one at that, to guiding you to all the best restaurants in town and things to do while you're here. If you're planning on visiting the area, or just want to keep up with all the goings-on, follow us on Facebook, Twitter and Google+ to find all the upcoming events, tips and news on what's happening in Lake Tahoe!